Glucerna nutritional shakes are a line of diabetic meal replacement drinks made by Abbott Nutrition. They are formulated with low glycemic carbohydrates to ensure better control of blood sugar. The drinks are ideal for people with diabetes or those with glucose intolerance. They are also often used as a part of a structured weight loss program. Glucerna also offers meal replacement bars which, like the shakes, are low in sugar and carbs but high in protein. Moreover, Glucerna products are all gluten-free, kosher, halaal, and suitable for those who are lactose intolerant. Glucerna shakes are manufactured to the specifications of the American Diabetes Association and American Heart Association which favor monounsaturated fats and limit calories from saturated fat to four percent. In terms of protein, one eight-ounce drink is equal to approximately one and a half whole eggs. On average, 46 grams of protein are recommended daily for an adult woman, while 56 grams are recommended for an adult male. However, there are some questionable ingredient in Glucerna shakes, including the use of fructose and artificial sweeteners. While fructose is generally considered safe for people with diabetes, the overconsumption is believed to increase the risk of diabetes in non-diabetics. The same applies to artificial sweeteners wherein the thrice-daily use of sucralose and acesulfame potassium (both contained in Glucerna) has been shown to impair the glucose response in non-diabetics, according to a 2017 study from the University of Adelaide in Australia. 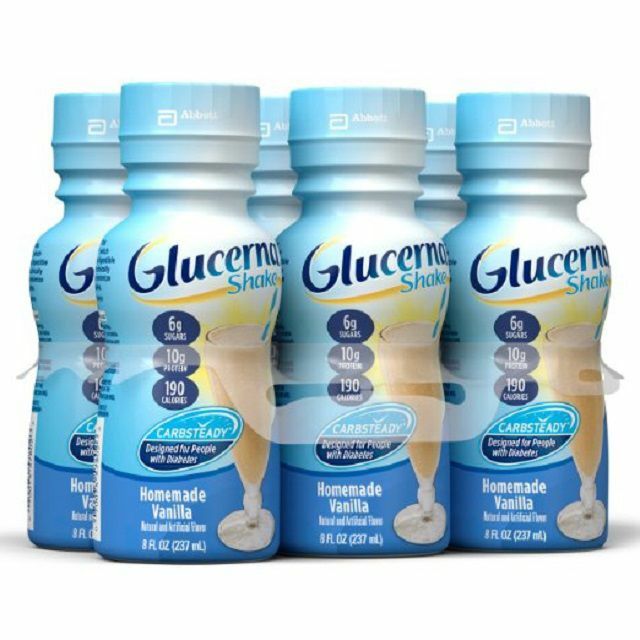 Glucerna shakes are a surprisingly tasty, vitamin-fortified snack ideal for diabetics and those trying to lose weight. The products are well balanced with low carbs and enough protein to offer a nutritional boost. While they will not provide enough carbs and calories for a total meal replacement, they could certainly be used as a nutritional supplement as part of a balanced diet plan (especially when extra calories or proteins are needed). While early research suggests that fructose and artificial sweeteners may pose a risk of type 2 diabetes, the data still remains unclear. As such, Glucerna shakes should be a considered a handy snack or supplement rather than a regular source of food replacement. In the end, it is always better to eat real protein rather those derived from processed foods, including packaged shakes. Young, R.; Isaacs, N.; Schober, G. et al. "Impact of artificial sweeteners on glycaemic control in healthy humans." 53rd Annual Meeting of the European Association for the Study of Diabetes. Lisbon, Portugal; September 11-17, 2017; abstract 193.